Bubba the Pirate: Celebrate with Me! I've never been a very good example of anything, except perhaps being too stubborn to give up on an idea; too dumb to understand the odds stacked against me. The last week or so has been full of important anniversaries of how seven years of stubborn has actually worked out. I invite you to celebrate with me. Last December, I emailed a guy in Milwaukee about a boat he was selling. That boat turned out to be s/v Bella, now the love of my life. Bella and I are sailing south next summer. Most of my adult life I've been dreaming of and working toward living on a boat. I actually did for a while in Sarasota. I found a boat and quit my last “career” job in April 2007 and set to work pursuing my dream in earnest. That boat was quite a project and like an old house, for every project I got started I found three more that needed done. I kept slogging along but my dream was about sailing not about perpetual boatwork. Last August I had a long, heart-opening discussion with a friend. Accidentally, I had laid bare exactly what I needed to do next. Before I knew it I had placed an ad online that began: “I'm broke, I'm exhausted ...” 12 hours and 4 emails later, I had found the boat a new home; I was free again. Well, free more in the sense of free fall. There were a few rough days back then. Friends and family will attest that I went through a period of swimming in possibilities. I was going to take a months long Zen retreat, then I was going to move to San Francisco; wait … Boston. There was a live-in internship at a homeless shelter I looked into; a motorcycle, an RV, etc. Without the project I'd been working on for seven years, I no longer had anything looming over me every day. Suddenly, I had no forward motion. Without forward motion, called 'way' by sailors, a boat has no steerage. I was that rudderless boat for a time. Since I found another boat and things are back on track, more than one friend has complimented me for giving over to the universe, for trusting that things would work out. I have smiled and nodded at the idea, but the trust story is apocryphal. At the time I never thought “OK, I will now let the universe handle this.” I was pretty messed up. I'm sure I drove those around me crazy as every day came a new, really important idea of what I could do next. Not knowing anything better to do, I kept stumbling toward my vague plan. Somewhere deep in my heart, I knew that if I didn't keep working toward a boat and a voyage, as I took my last breath on this planet I would wonder what it would have been like. The takeaway for me was that my plan was good, I had simply picked the wrong boat. I no longer needed to be local. I needed a lucrative job to save money for the next boat. I won't rehash the details again. 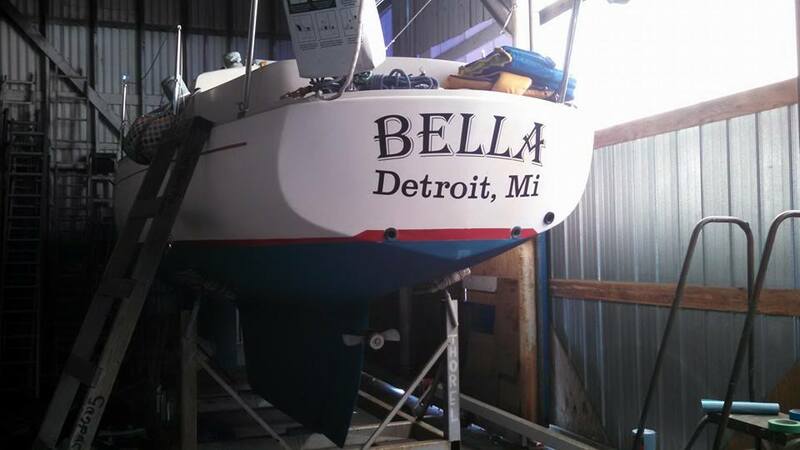 I have written about my frustrations, letting go of the last boat, finding Bella and getting help to buy her, getting her ready and sailing her 'home' across LakeMichigan. The first anniversary was December Second; the day I sent the email inquiring about a boat I saw on the Milwaukee Craigslist. December Third, I learned she was still available; December 10, I went to see her; and despite thinking I would play it cool, I made the deal on the 11th. Along the way, even before I had gone to see Bella, I was tightening up the details with a friend who helped me buy her before I had had time to build my savings. Voyaging is not about sitting in some idyllic harbor watching the sun set, its about raising the anchor and moving on. OK, there will be sunsets in idyllic harbors too. Perhaps a part of being stubborn is a way of trusting the universe. 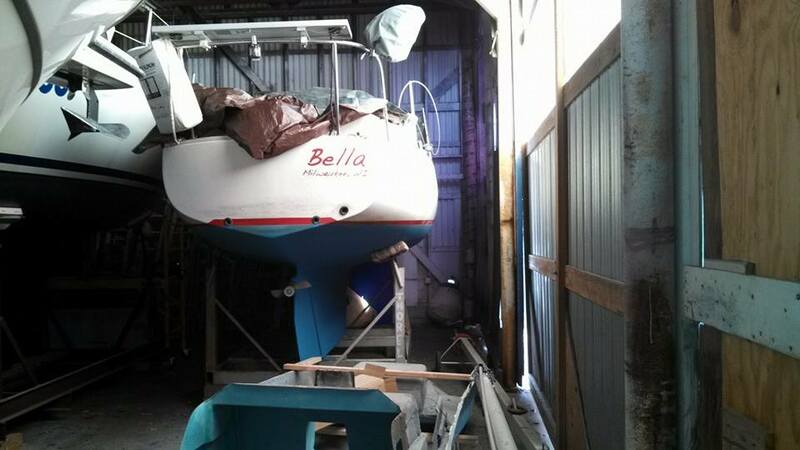 Either way, I went from letting go of an onerous project to finding a boat that was ready to sail. 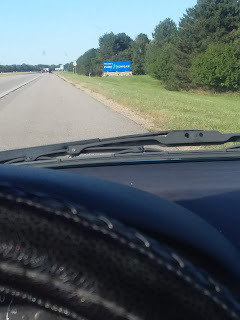 In August of 2013, I watched my project boat go off down the highway, out of my life. Four months later, I had found Bella. This last June, I sailed her 'home' to Muskegon from Milwaukee. In 7 or 8 months, Bella and I are headed south. The one thing I've wanted to do most of my life. No one dream is like another. What is your dream? Celebrate with me by pursuing yours! If you let go of the specifics of how you think it should go, the universe will help. Like sailing, you can't always go straight from Point A to Point B but if you learn to use the wind you can get there from another angle. Maybe you want to start a bakery, a dog shelter or a tree farm. Maybe you don't want a major change but you want time to make art or to learn to play an instrument. You might want to find a way to help others; a way to serve, to strive and thrive. Whatever it is, please be stubborn. Don't be hold tight to how you think it should be done, but be open to another way, but keep a 'weather eye' on your goal. Look to the horizon and don't get mesmerized by the water right in front of you. I take issue with your opening statement. You have been and continue to be a good example to many people. Maybe not always when you thought, or what you thought but a good example none the less!